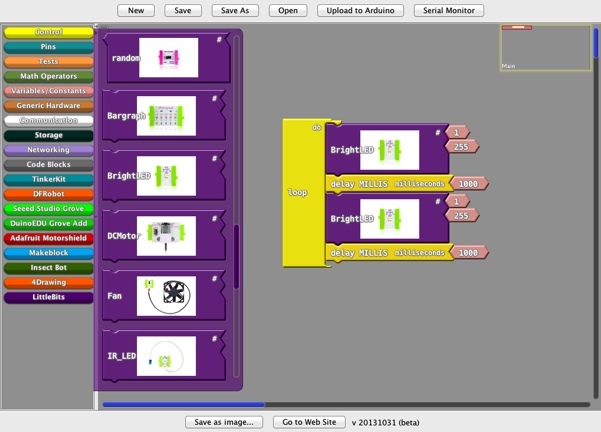 [Beta 20140702] LittleBits, 4Drawing, DuinoEdu and many bugs fixes! 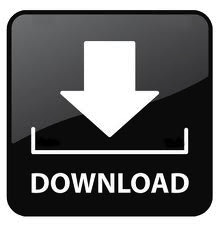 It has been a while since our last update. The development has not slowed down. We have a few more contributors adding codes to Ardublock. Big thanks to Tony Callear for many bug fixes and feature enhancement! Thanks to karlTH for contributing codes for DuinoEdu and added quite a few of blocks for some very exciting hardware! I have been trying to get it to work with littlebits but for some reason, this build has the Utilities item missing from the menu. any idea what I might have done wrong? when I install the older non-beta version, utilities is there but, of course, no littlebits menu items. I have not tested further due to a separate problem of the arduino software not seeing my arduino properly. It was changed to “Generic Hardware” at some point and I will change it back in the next releases. I’m excited about this Ardublock beta including the LittleBits modules. 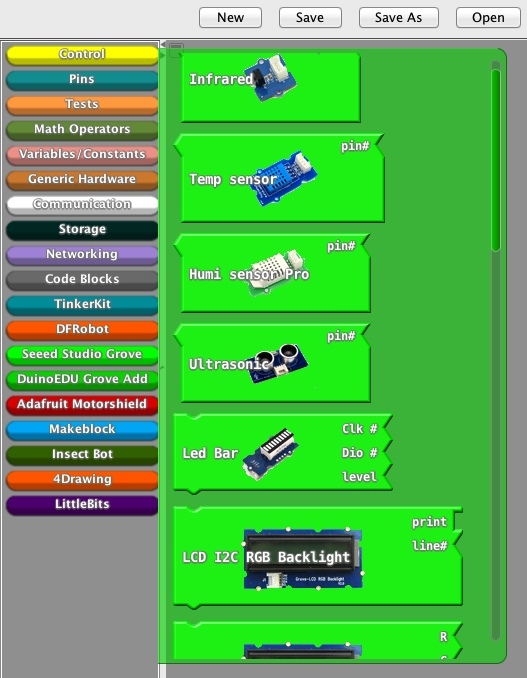 However, I noticed that the LIttleBits servo is not included as an item within the “LittleBits” menu. I did, however find “servo” within the “generic” menu. Would this work in place of the LittleBits servo? It should. Let me know how it works for you. If it doesn’t, we will add codes to support the LittleBit Servo. I tried Ardublock with Grove shield and Grove ultrasonic sensor; however, I receive an error “class Ultrasonic’ has no member named ‘mesurer’. Using the RGB LCD I get the error “class Ultrasonic’ has no member named ‘mesurer’. I tried a button (no library needed) and it worked. Any advice? Yeah that’s what I’m talking about ba-inb-yce work!